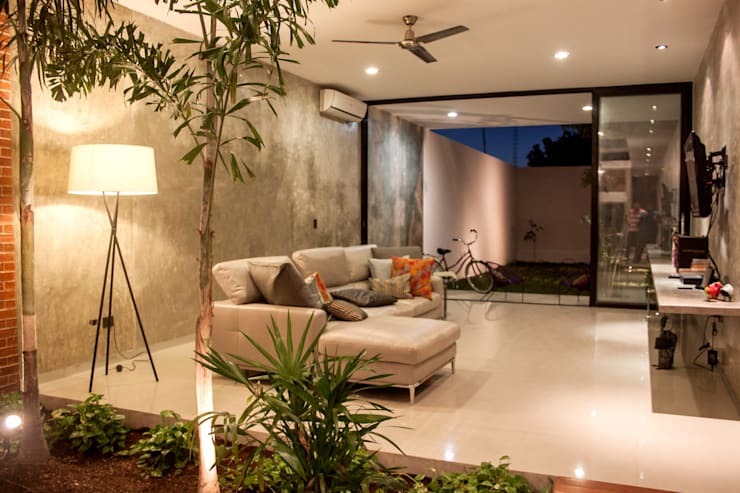 In the heart of Mexico we find a a new residence so spectacular it deserves a special mention on homify today. Welcome to the Loft PX, an impressive residential structure which serves as testament to what can be done with limited floor area and vertical ambition. 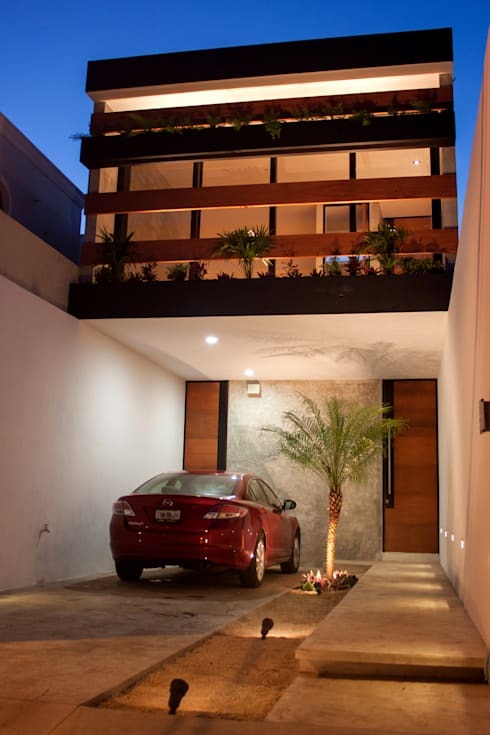 Desnivel Architects in Mérida, Yucatán, undertook this project and successfully finished it in 2014 with remarkable results. The house takes up two levels with all of the spaces optimally utilised. This skinny residence surprises all with its abundance of space on the inside. 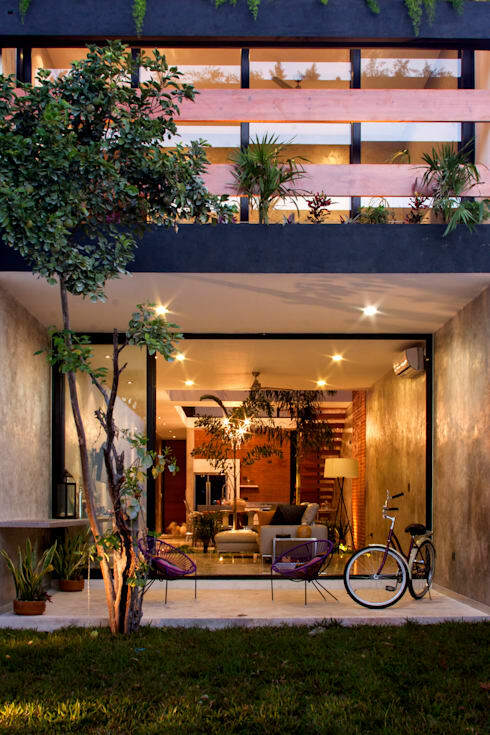 The leading architects on this project, Ariel Canto and Jorge Abraham have outdone themselves with creating an ultramodern home in a tiny space. Don't believe us? Let's go take a look! The front view of the house indicates to us just how small the width dimensions of the home is which the architects had to work with. The compact façade is all but disappointing, thought, as the architects make optimal use of what they had to work with. The concrete structure stretches tall and has a clear modern edge. 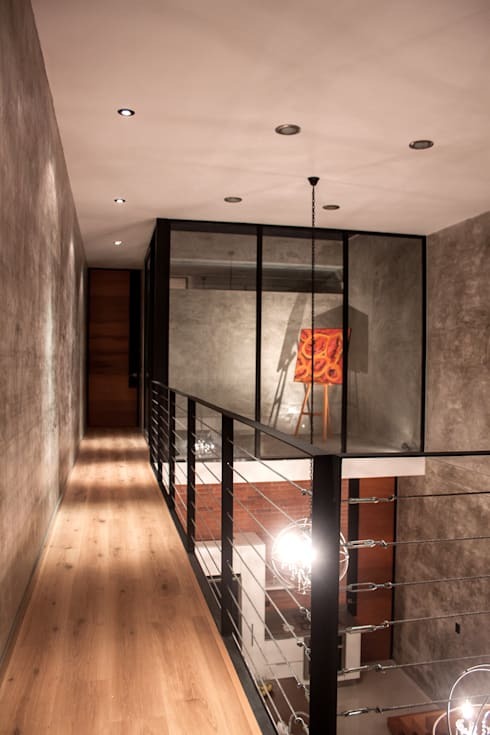 The clean material is subtly contrasted by wooden doors, and wooden balustrades on the second storey. The façade is spotted with vegetation, to add a natural charm and to soften the hard edges of the concrete structure and timber planks. Inside the home we find the living room which takes up much of the first floor area space. The concrete walls are unadorned and left in an unfinished, tough form. 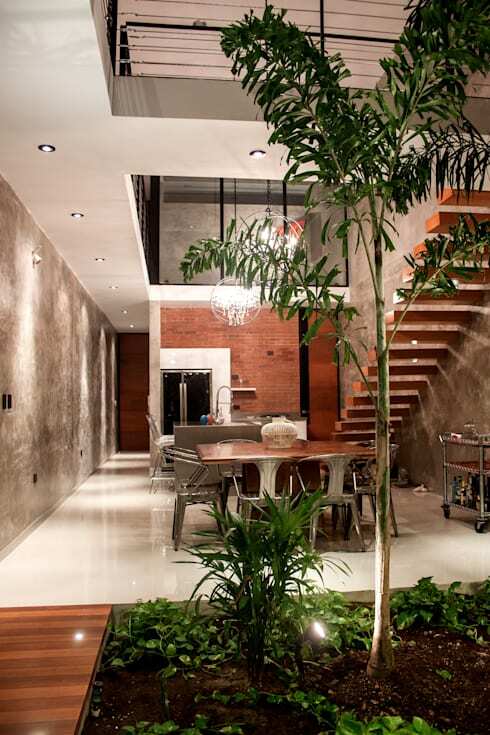 This provides an industrial edge and simply elegant ambience. The furniture in the room is similarly subtle and neutrally coloured. This allows for extended perceived space—making best use of the area available. The living room looks out on the back porch through large glass sliding doors, making this the ideal room for inside-outside living. The space flows effortlessly from the interior to the back yard, ensuring easy entertainment and endless parties. Although the width of the house leaves much desired, it sure makes up for it in its length. As we can see here, the house stretches out from the entryway and leaves much space for several different areas in this open-plan living floor. Here we can see the kitchen area against the back of the wall. It is a functional space consisting of the necessary appliances, and a stainless steel work area. This is indicative of industrial inspiration, and ensures a clean, professional kitchen environment, similar to those found in state-of-the-art restaurant kitchens. In this compact area, the architects have created a kitchen fit for any food-lover. If you're also looking to design your interior in an industrial style, find some inspiration here: Get The Industrial Look At Home. When we zone out a little bit, we can see the dining room area beyond the kitchen, as well as the stairway that leads up to the second floor. 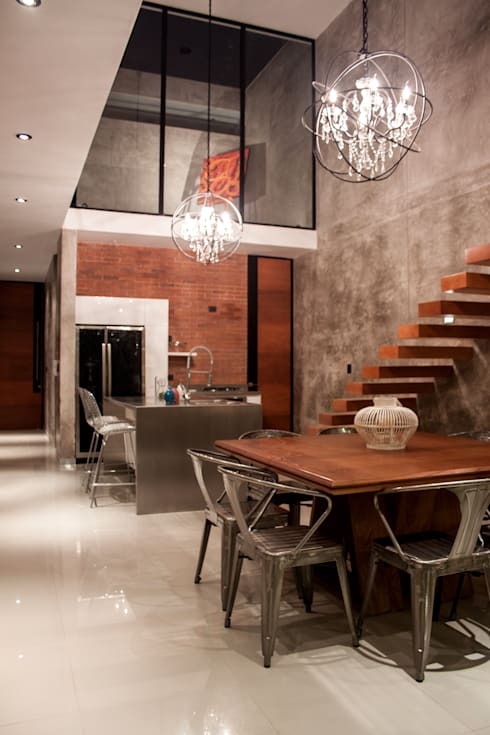 This stairway is of modern design without any banisters and with the illusion of floating. We can also see a bedding of plants between the dining area and the living room. In this manner, natural elements are brought into the home to play of the minimal and industrial ethic of the home's interior. This green addition makes the house feel homier and creates a healthier atmosphere. The dining room consists of a small dining table with wooden top, and accompanying steel chairs. To the right of the area there is a classic service cart, well-stocked for many a dinner party. Moving up to the top storey, we find wooden walkways, sectioned off by metal and steel-wire balustrades. The majority of the area on this level is open and not functionally utilised, which serves to extend the lower level vertically, improve ventilation and perceived space. At the back there is a glass chamber, which can be used as a workshop or study. This room allows for a panoramic view of the rest of the loft. Dispersed ceiling lights allow for the even lighting of all the spaces in the loft. Here we can also see a pendant chandelier hanging from the ceiling to the lower level. This adds a luxurious touch to the interior design. Our last interior space we will visit today is the master bedroom. The immediate impression that we get when we walk in here is that of a subtle and warm space, setting the scene for romance. 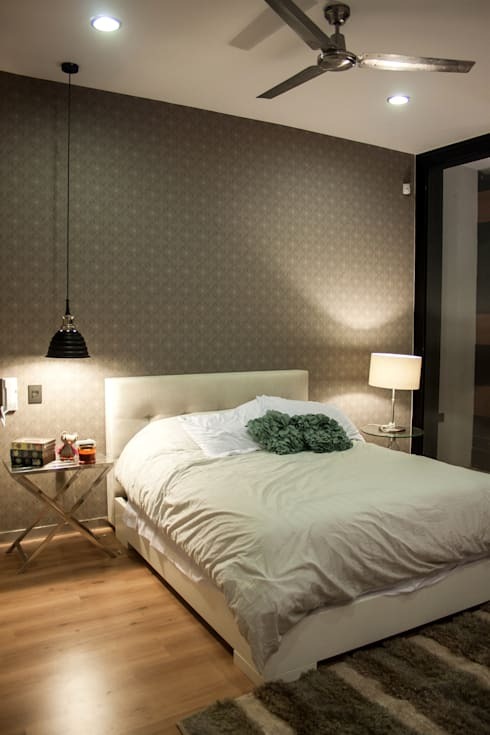 The wallpaper is in a neutral colour but contain intricate design detail to add interest. The lighting consists of a series of table and low-hanging ceiling lamps that warmly illuminates the room to add to that romantic atmosphere. The furniture is minimal and simple, keeping to the design style of the rest of the house. The textiles of the bedding are soft and inviting. You wouldn't want to take a nap in this comfy-looking bed? After we have viewed the façade and the entire interior of the home, we get the opportunity to see the outside at the rear. Here, once again, the top floor holds a balcony and wooden balustrades, adorned by vigorous vegetation. The porch itself has little furniture, but certainly looks like a space where you can entertain in style. Since there are little permanent fixtures in the area, the porch can be furnished and decorated as the event demands. The perfect spot for summer entertaining! From this point of view, we can see right to the back of the the narrow home, much like the quaint shotgun houses of New Orleans. The difference here, is an ultramodern twist. Did you like the loft’s subtle mix of industrial style and natural elements? Let us know!